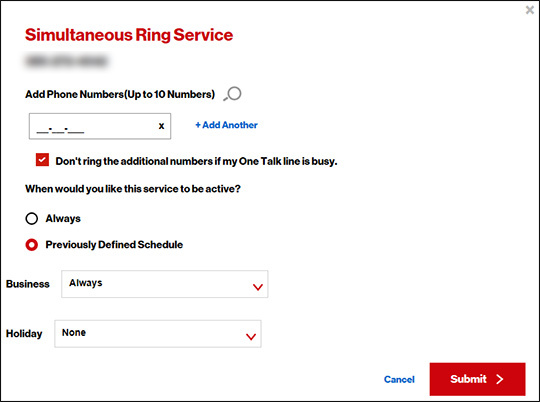 Turning on Simultaneous Ring causes all of the user's devices sharing the same number to ring during an incoming call. 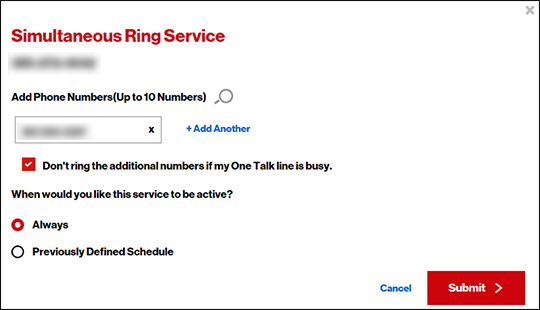 Setting Simultaneous Ring on individual One Talk lines can alter what devices receive the call. If a call is rejected from any of the ringing lines, the caller will be directed to that number's voicemail. If Simultaneous Ring is turned on and any of the simultaneously ringing lines are set to call each other, a call loop is created which causes the caller to hear dead air or a disconnect recording. Click the Lines & Devices tab. Click the blue Phone number link. Enter the desired phone number into the Search field to easily find it in the list. Click the Gear icon next to Simultaneous Ring Service to configure settings. Enter up to 10 phone numbers (10-digit) that you want to ring when the selected MTN is called. Select 'Always' or 'Previously Defined Schedule'. If selecting 'Previously Defined Schedule', Select the preferred option using the dropdown boxes.